DDG Board members and visitors at the meeting in Santo Domingo on February 12, 2018. 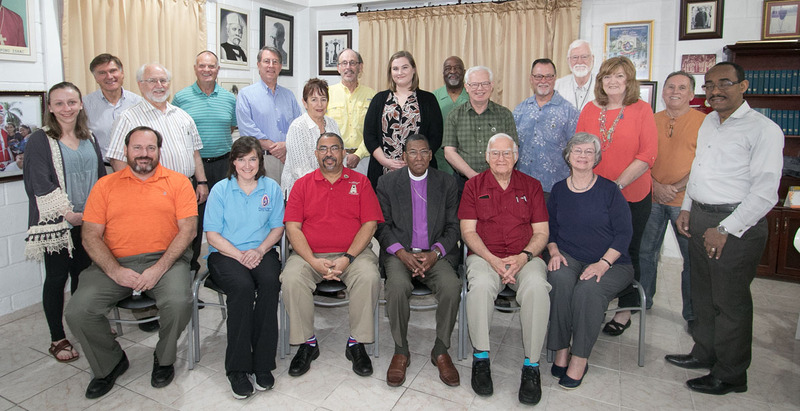 Missioners from fourteen dioceses that support mission teams in the Dominican Republic were present. Front row, from left: Bill Kunkle, Executive Director, Diocese of Southwest Florida; The Rev. Deacon Beth Drew, President, Western Michigan; The Rt. Rev. Wendell N. Gibbs, Jr., Second Vice-President, Michigan; The Rt. Rev. Moisés Quezada, First Vice-President, Dominican Republic; The Rt. Rev. William J. Skilton, Dominican Republic; Julia Ariail, Secretary, Georgia. Second row, from left: Lydia Pendleton, New Hampshire; The Rev. Marshall Huey, South Carolina; Tom McGowan, Nebraska; David Morrow, Treasurer, Northwest Texas; The Rev. Ed Miller, President-Elect, Virginia; Sally Thompson, Southwest Florida; John Gruetzmacher, North Carolina; Katie Forsyth, Eastern Michigan; The Rev. Albert Hilario, New York; The Rev. John Schaefer, Nebraska; The Rev. Jeffrey Nelson, Nebraska; Julius Ariail, Georgia; Missionary Karen Carroll, Dominican Republic/Southwest Florida; Missionary Charlie Nakash, Dominican Republic/New Jersey; The Rev. Deacon Alexander Romero, Dominican Republic. The Board of Directors of the Dominican Development Group met in Santo Domingo on Monday, February 12, 2018. Reports and other printed information distributed at this meeting are being added to this page as soon as they are ready for posting. Please check back frequently for the latest additions.